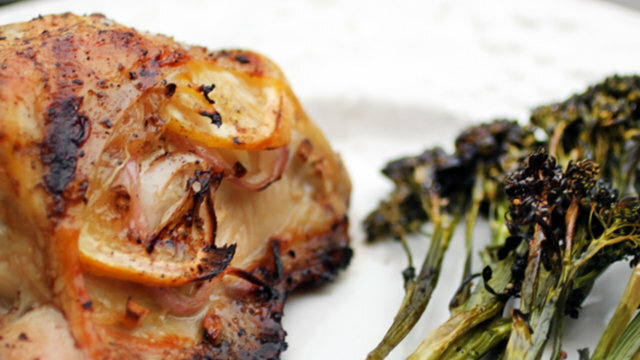 Today’s installment of the 50 day nightshade recipe challenge is grilled split chicken breasts. This is an easy dish to cook, nothing fancy and only takes about 30 minutes to prepare and cook. Serve with your favourite vegetables for a crowd pleasing meal. Rinse chicken under cold water and set aside. Carefully lift the skin from the breast creating a pocket. Place the garlic, lemon, and shallot under the skin, and stretch the skin a bit to cover the stuffing. Sprinkle the chicken with salt and pepper. Place chicken breasts on grill, bone side down and cook for 10–15 minutes, depending on the thickness of the breasts. Carefully flip the chicken, grill for 5–7 minutes on breast side. If the chicken needs to cook longer than this time, flip it back to the bone side, reduce heat to medium-high, and cook until meat is white (or 165°F in the thickest part of the breast). Many thanks to primal palate for the recipe idea.